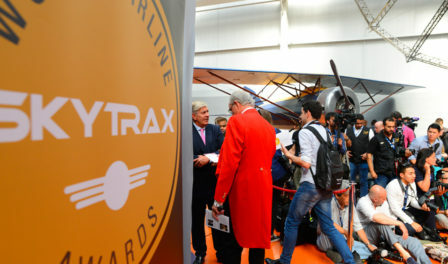 Qatar Airways were named Airline of the Year in the 2015 Skytrax World Airline Awards at Paris Air Show. Posted on 16th June 2015 in 2015 World Airline Awards. Paris Air Show. This is the third time in 5 years that the Doha based carrier has triumphed in the top award category. 2014-15 has been something of a landmark year for the airline, having moved to a new home at Hamad International Airport, as well as welcoming the A380 and A350 aircraft into their fleet. At the present time Qatar Airways is currently the only airline where customers can travel on the A380, A350 and B787 Dreamliner. Qatar Airways were also named Best Airline in the Middle East. This remains one of the most competitive regions in the survey with both Emirates and Etihad also securing top 10 places in the worldwide ranking. Qatar Airways won the Best Business Class Airline Seat category, coinciding with their introduction of the A380 and A350 aircraft where their latest seating designs have set new benchmark standards of comfort, space and privacy. 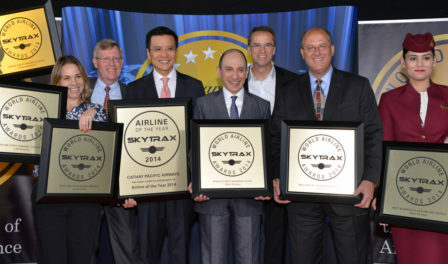 Singapore Airlines was honoured as the Best Airline in Asia, ranked No 2 in the global ranking. Singapore Airlines was named the World’s Best Business Class and also took the award for the world’s Best First Class Airline Seat. Emirates retained their stranglehold on the World’s Best Inflight Entertainment award winning this for the 11th consecutive year, continuing to have the edge over its closest global competitors despite continued hardware and programming improvements by airlines across the industry. Japanese airline, ANA All Nippon Airways, received significant acclaim for its staff service by winning two awards. ANA was named as having the World’s Best Airport Services which recognises front-line airport staff – from check-in through to the gate, arrival, transfer and lounge. ANA was also Ranked No 1 for having the Best Airline Staff in Asia, this being a title that aggregates the Quality of both Airport and Onboard staff service provided by an airline.